Chidinma Inspirations: Day 3 Of The 28 Days Challenge Of Say NO To Fizzy Drinks, YES To Water! Day 3 Of The 28 Days Challenge Of Say NO To Fizzy Drinks, YES To Water! How did your Day 3 go today? Where you tempted to take fizzy drink today? Please kindly share your Day 3 experience with us. So my dear people, how was your Day 3? 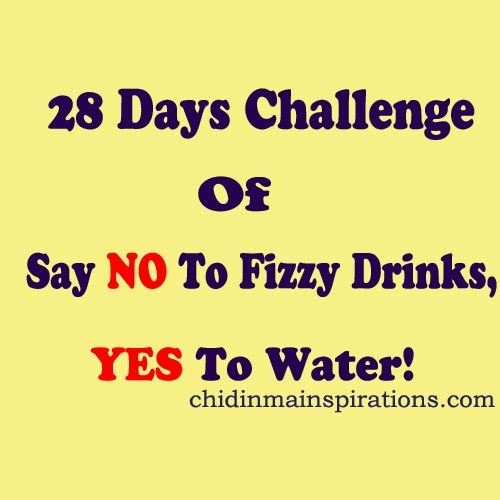 P.S- Here >>> http://www.chidinmainspirations.com/2015/01/say-no-to-fizzy-drinks-yes-to-water.html?spref=tw … is what this challenge is all about. Please kindly invite your friends to join us in this challenge and together, we will inspire one another. Lol,water all the way o.no time. Lol. Do keep it up dear. Awwww. My day was totally out of it. I was tempted ooo. In fact, over temptioussssss. After trekking under the hot sun in the streets of Warri hunting for job, OMG, come and see me gasping for air. Didn't know when I sat at this spot and order for a bottle of coca cola. Shop Attendant: Oh, we don't have coke again sir. Then I crossed to the other side of the road where I saw more shops. Me: Abeg, your coke cold? Maama: E no too cold, but you fit manage am, my pikin, the light here no good. We no see light ON fridge, na generator we dey use small small. Maama: make I bring am make you check am, if e no cold reach, you leave am. After I left, I shouted inside of me, aaaahhhhhh, I don break the rules of this fizzy thingy on Chidinma Inspirations. (Chichi, Paul, and Anthonia, hope you won't sue me to court oo). Don't worry dear Dauda, there is always tomorrow. As long as you had the challenge in mind, you will be just fine. Tomorrow is another day. Lolzzz, yesterday was cool for me but I break the rules today o. Was tempted too. But tomorrow is another day..
Lol. That's good to hear dear.